The Sandstone White back panel of OnePlus 5T Star Wars Limited Edition smartphone is inspired by the white-coloured salt plains of the mineral planet Crait, featured in the movie. The red of the Alert slider is based on the red-coloured mineral mined on the planet. The company has also bundled a rugged case with the OnePlus 5T Star Wars Limited Edition, one that is designed after Kylo Ren's helmet from the movie. The smartphone will only be available in an 8GB RAM and 128GB inbuilt storage variant(Not expandable), with OnePlus choosing to forego the 6GB RAM and 64GB inbuilt storage variant. 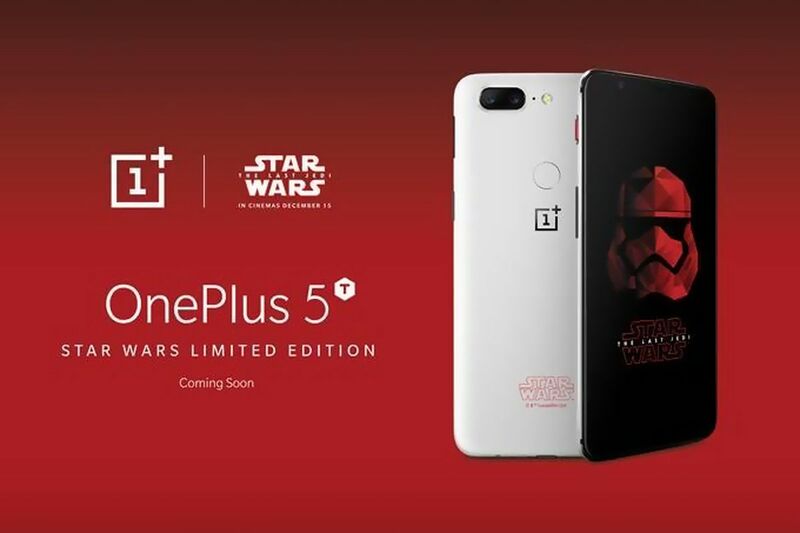 The OnePlus 5T Star Wars Limited Edition is identical to the regular edition in terms of specifications. The dual-SIM (Nano) OnePlus 5T runs OxygenOS based on Android 7.1.1 Nougat. It bears a 6.01-inch full-HD+ (1080x2160 pixels) Full Optic AMOLED with an 18:9 aspect ratio, 401ppi pixel density, and 2.5D Corning Gorilla Glass 5 protection. The display also supports sRGB and DCI-P3 colour gamuts. It is powered by an octa-core Snapdragon 835 SoC, clocked at up to 2.45GHz, paired with either 6GB or 8GB of LPDDR4X RAM. The OnePlus 5T bears a dual rear camera setup, with one being 16-megapixel Sony IMX398 sensor with 1.12-micron pixels, an aperture of f/1.7, and a focal length of 27.22mm, while the other is a 20-megapixel Sony IMX376K sensor with 1-micron pixels, with the same aperture and focal length. The rear camera setup is accompanied by dual-LED flash. OnePlus 5T's front camera sports a 16-megapixel Sony IMX371 sensor with 1-micron pixels and an aperture of f/2.0. It is powered by a 3300mAh non-removable battery, weighs 162 grams, and measures 156.1x75x7.3mm.